One of the top employment lawyers in the state, Nancy Rafuse’s rise to prominence in the legal field was far from likely. There were no attorneys in her family leading the way, and as one of six children, she couldn’t afford to attend an expensive law school. What’s more, she used to be a self-described introvert; addressing a jury was the stuff of nightmares. “I couldn’t even stand the thought of giving a presentation in a regular classroom,” says Rafuse, fifty-one, a managing partner at Polsinelli. But as a kid, she did enjoy arguing to get her siblings out of trouble. “I was the public defender at the dinner table,” she says. By the time she was ten, she had decided she would one day become a lawyer—but a transactional one, not one who spoke in front of a courtroom. 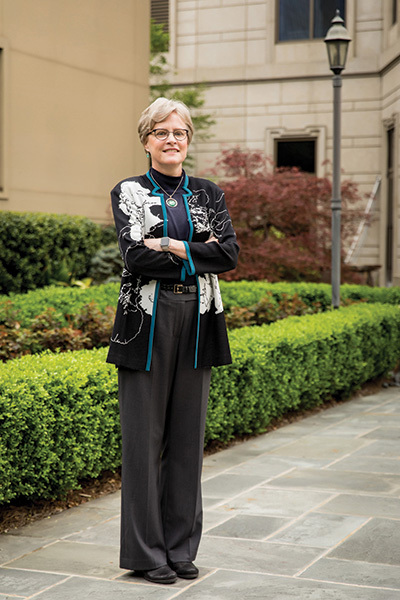 That remained the plan throughout her undergraduate years at the University of Georgia and her first year at its law school, but a clerkship in Savannah with Judge B. Avant Edenfield changed everything. The judge would have her watch the trials over which he presided, then ask her what she thought. To her surprise, she found herself talking animatedly about the lawyers’ successes and missteps. By summer’s end, she’d come to believe she, too, could be a trial lawyer one day. Rafuse now serves as lead trial counsel for a number of major corporations; Chambers USA ranks her a Tier 1 labor and employment lawyer in Georgia. When the mother of two made partner at her firm, Judge Edenfield sent her a handwritten note of congratulations. He passed in 2015, and Rafuse recently founded a UGA Law School scholarship in his name. Every year, it will go to someone from Georgia who’s the first person in his or her family to become a lawyer. “Hopefully it creates the same opportunity for other kids like me,” she says.